Intel has taken the wraps off of its Purley series of Xeon processors, and it appears that there are a few candidates for possible processors that could be included in Apple's iMac Pro, slated to launch this December. Intel revealed 50 different Xeon chips on Tuesday, and in doing so replaced the older E5 and E7 lines built on the Haswell architecture. While the new chips are aimed at the data center, the Xeon chips in the Mac Pro line were as well. What specific chips will be used? Intel has grouped the chips by two different sets of criteria —one precious metal themed, and the other ranging from best performance to most energy efficient. Presumably, for a computer intended for raw performance, Apple will use either chips balanced for power efficiency and performance, or the highest performance chips possible. The 10-year processors, and the Omni-Path Architecture chips are likely not suitable for workstations, and are not included. There are two eight-core chips in the highest performing tier —the gold-rated 6134, and the 6144. The former is a $2200 3.2 GHz chip, and the latter a 3.5 GHz chip with a price as yet unavailable. There are no 10-core processors available from Intel at this time in the high performance chip range. As far as 18-core processors go, there are two options. One is the $3358 2.7 GHz 6150, and the other is the 3.0 GHz 6154 which is also unpriced. Intel considers both processors to be classified as gold chips. The lone silver chip on our roundup in the balanced offerings is the $510 eight-core 4110 processor, running at 2.1 GHz. There is also a single 10-core processor, the gold-rated 5115 for $1221 per chip, running at 2.4 GHz. The only 18-core processor in the class is the 6140 running at 2.3 GHz, and retailing at $2450 per chip at volume. Why Purley, and not existing Xeon processors? Purley has been Intel's codename for its architecture meant for processors destined for high-intensity tasks like those found in data centers, rather than for the relatively smaller work loads of single-user desktops. A core feature of Purley processors is its use of a mesh-based architecture that replaces the ring architecture Intel has used in its Xeon processors for the last eight years, with the switch aimed at decreasing latency in systems with many processors and cores. Purley effectively allows for up to 28 cores to run on a single LGA3647 motherboard socket, with support for up to 8 sockets to work together in the same computer —which may have implications for the future Mac Pro. This inter-core connectivity lends itself to computationally intensive tasks, including artificial intelligence, simulations, encryption, and other high-demand applications. While the iMac Pro will use Mail, and iTunes fine, that use case is really not the point of the machine. High Sierra code found in June points to Apple's future use of Intel's LGA3647 socket, the server-grade component reserved for the Purley Xeon platform. Purley is the evolution and consolidation of the Haswell-based Xeon E5 and E7 platforms and supports the new high-end Skylake class Xeon silicon. 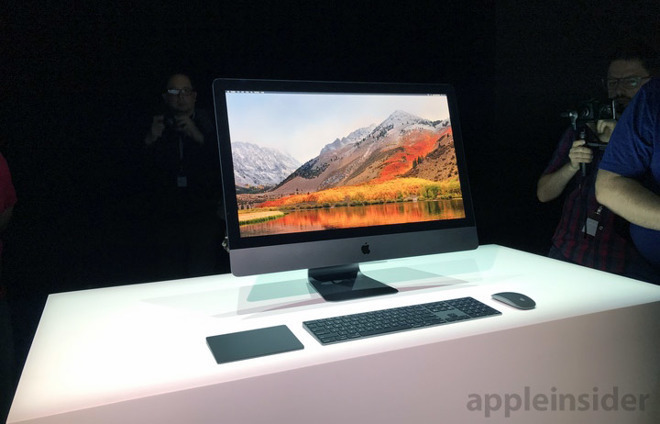 The information in June, and in Tuesday's official release of data on the Purley line, dovetails with Apple's previous announcement at WWDC that the iMac Pro would have an 8-, 10-, or 18-core Xeon processor. Note the singular use of the word "processor." At this juncture, it does not appear that the iMac Pro will have more than one processor chip. If Apple used the E5 and E7 Xeon platforms, it could have shipped the iMac Pro already, and it would cost the same and perform slightly worse, given the price and speed of the E5 and E7 chips. The only real reason for Apple to wait until December for the iMac Pro is supply and availability of Purley. Apple came under fire when it revealed the $4999 price of the iMac Pro. That was tempered somewhat when enthusiasts started breaking down component pricing, and had difficulty matching the actual components known to be included even in piecemeal builds. Pricing on the Purley processors range from $213 to $10,009 —not all that different from E5 and E7 Haswell-based Xeon chips available for the last year or so. But, Xeon pricing remains above and beyond Kaby Lake processor pricing. The iMac Pro may be starting at just under $5000, but at the high end based on processor and storage prices alone $15,000 may not be out of the question.